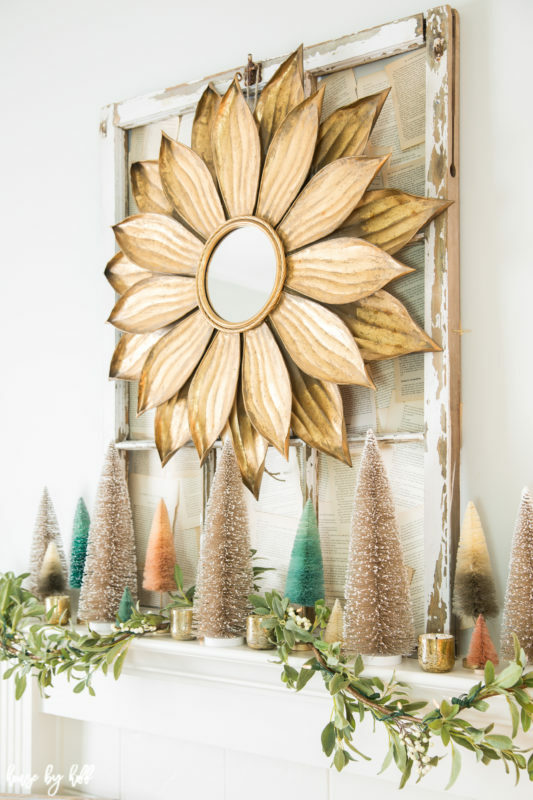 Today’s holiday mantel post kicks off the first holiday post of 2018! 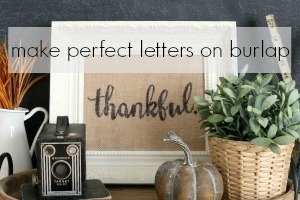 I’m thrilled to be joining a fabulous group of bloggers on a mantel blog hop today hosted by the lovely and talented Krista from The Happy Housie. See the entire lineup at the end of this post. As is custom in this house, there are little vignettes everywhere. Vignettes galore. I love to start with a tray for most of my little vignettes. This tray has been such a good one over the years. I use it again and again and again. A few of these pieces I already had on the tray, but I added a few small bottle brush trees (because, like I said, they’re everywhere!) 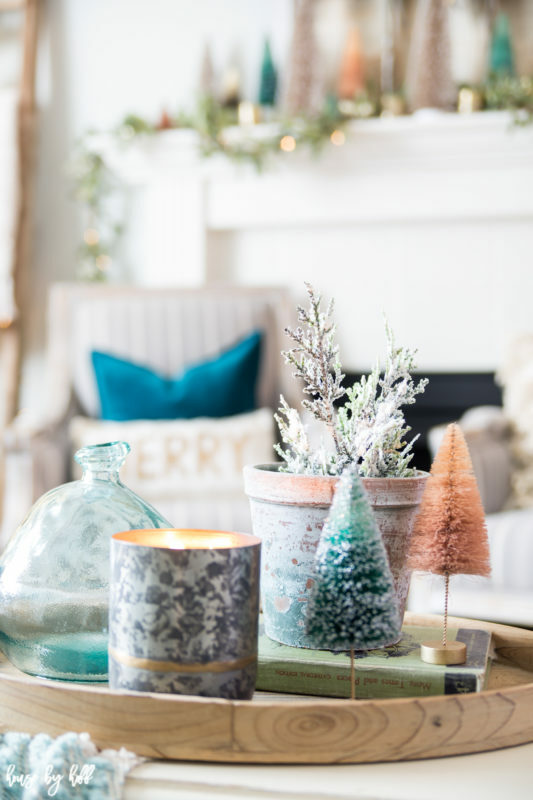 to make this vignette more seasonal. 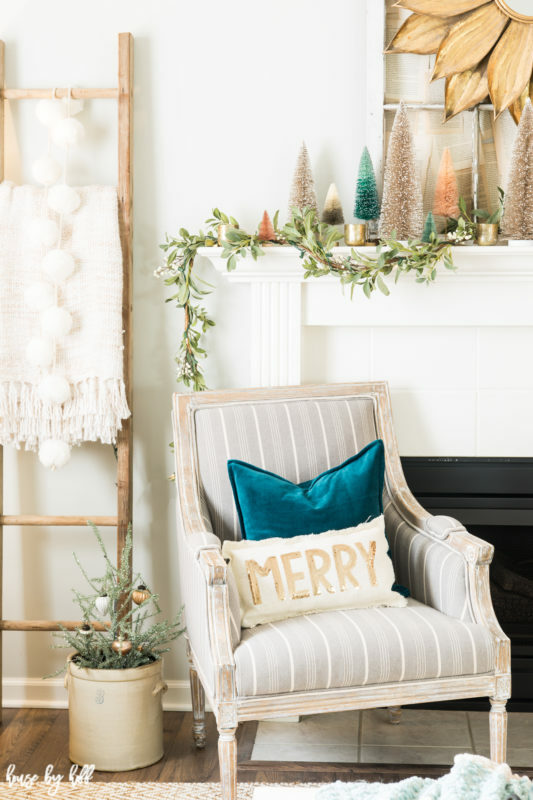 I decided to add some velvet pillows in a deep teal to my holiday decor this year. Last year I went extremely neutral, and this year I was excited to add a bit more color to the palette. 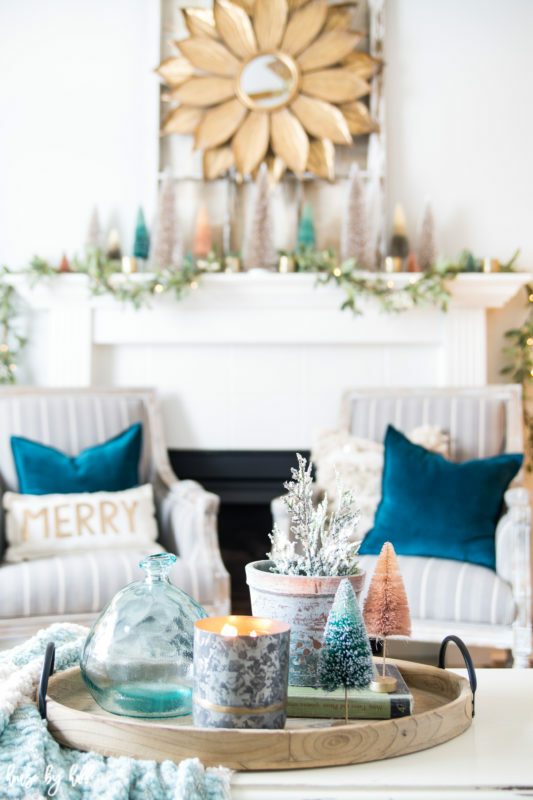 I love the way the teal pillows play with the colors of the trees on the mantel. The Merry pillow is also super cute! These colors aren’t really traditional holiday colors, but I really think it’s fun to play with color during the holidays! 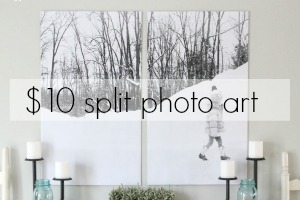 It’s great to decorate with reds and greens, but why not switch it up a bit? Just watch, next year I’ll be back to reds and greens…ha! 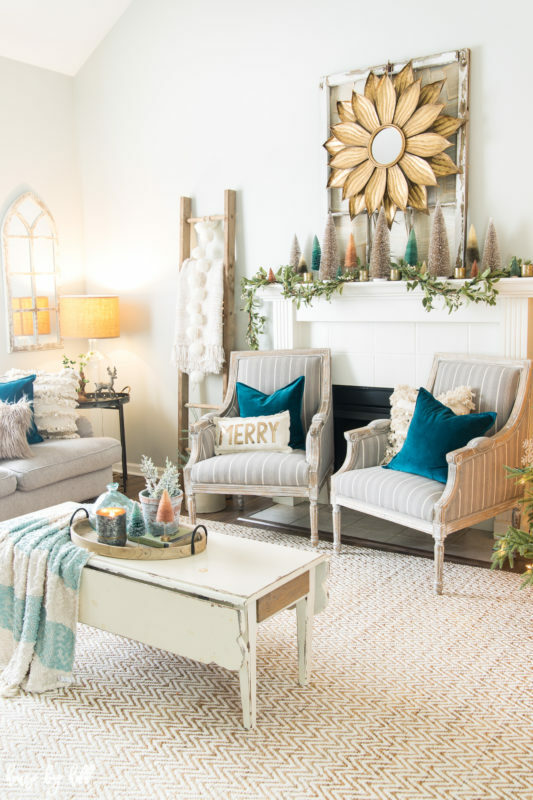 As promised, there is a whole lineup of fun blogger mantels and vignettes for you to check out today! It’s looking beautiful April! Love the pops of color. I love those pops of turquoise, absolutely stunning. 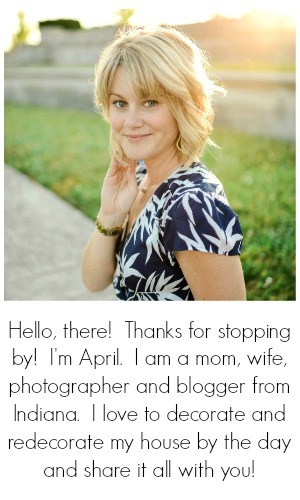 Thank you for sharing and being a part of the blog hop April. 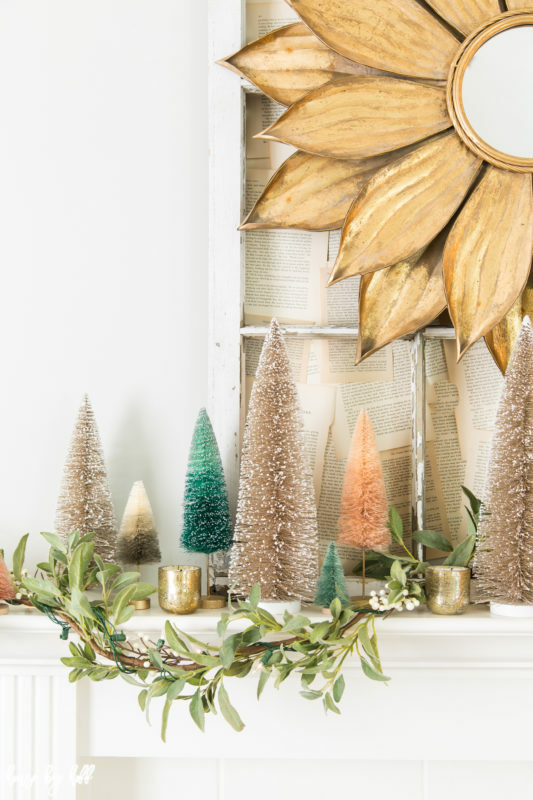 Bottle brush trees are my favorite, I love your mantel this year, April! So pretty as usual my friend. hey girl- love the room! so pretty! Happy Thanksgiving!! Thank you so much, Shawnna! Happy Holidays to you, friend! So beautiful, I love the vibrant pops of color! Love it so much, April! 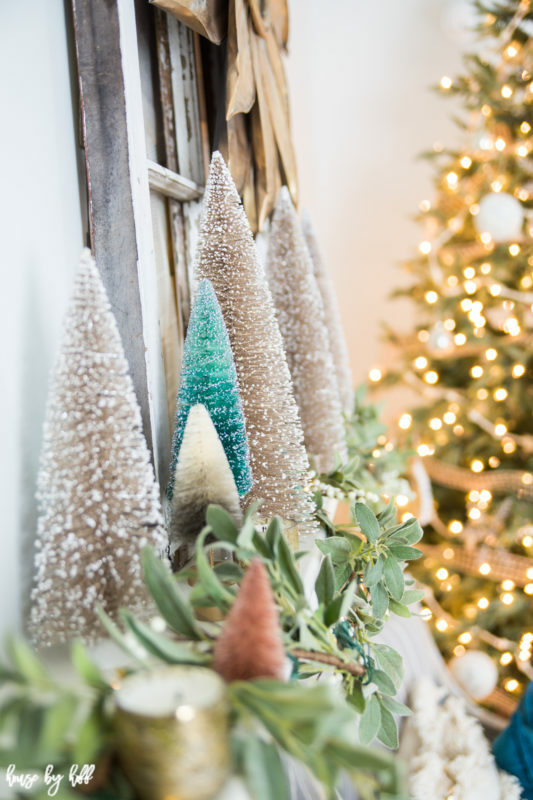 Bottle brush trees for the win! 🙂 Hope you’re having a great week!